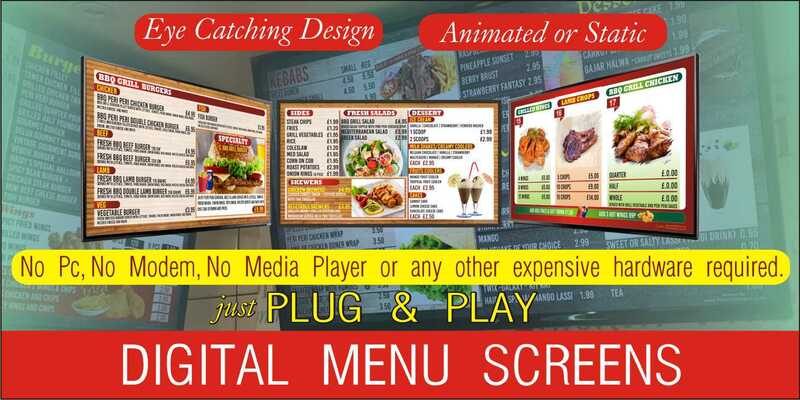 Digital Screens – Digital Menu for Restaurants and takeaways. It’s a time to get rid of your outdated and old styled menu boxes and replace them with new style, eye catching, and fully Animated Bright Digital Menu Boards that grab your customers attentions and increase your sale. No complicated cabling or network needed. No Pc, Modem, Media Player or any other expensive hardware. No Poster or expensive backlits printing. Professional Eye Catching Designing/content creation. No ongoing management or support costs. Free Advice and guidance from our experts.